Things I liked: The gun can take allot of abuse, metal magazine, can be dissembled, for spring powered gun the fps is fairly good, you get a free metal silencer. What others should know: Don't over tighten the silencer or you will break your external barrel, as a springer it's meant for fun and just to mess around, for skirmishes get a c02 pistol & remember pistols are for defense & should be used as a secondary weapon, I would not use a springer for anything other than target practice and messing around. Over all it takes allot of abuse and has some good internal metal pieces in the trigger mechanism, take down is easy and it's all around well built and should take allot of abuse. With the fps, add in heavy ammo and you have a fairly good mess around gun that will not break easy, minus the thread for the silencer.. don't over tighten it, that's the only con. 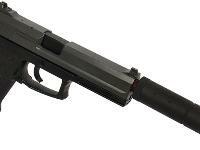 Things I liked: NAVY SEAL MK23 .. WHATS NOT TO LIKE ABOUT IT?? ITS ACCURATE!!! 1/1 REPLICA!! FEELS SOLID!! EASY TO DISASSEMBLE!! 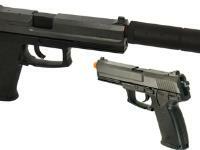 METAL SILENCER INCLUDED!! TWO HEAVY WEIGHTED MAGS! 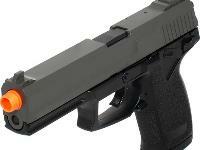 OPEN EJECTION PORT!! THIS IS ONE OF MY FAVORITES IN MY COLLECTION !! ITS A BEAST!!! GET IT NOW FPS ON THIS IS CRAZYY! ITS POWERFUL!! Things I would have changed: I WOULDN'T CHANGE ANYTHING ABOUT THIS PISTOL IT IS 5 OUT OF 5 FOR ME!! What others should know: ENJOY!! 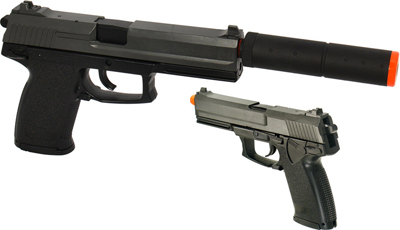 What others should know: The silencer is metal and it makes the gun more accurate, but it also makes it a lot more heavy. Another thing is since the silencer is metal but the barrel isn't if you barley hit is against something it could break the barrel.